Comic books are big business, which is why this local business is in such demand for its comic-care services. You can’t expect comic books involving Kraven the Hunter and Doctor Doom to be read with kid gloves. They tend to get dog-eared, food stained or simply shabby. So when those super-hero page-turners need a sprucing up, Victoria’s Freshly Pressed Comics comes to the rescue. Owned by Cameron Hacault, an avid comic-book reader, collector and care technician, Freshly Pressed cleans and presses comics for clients across the continent. 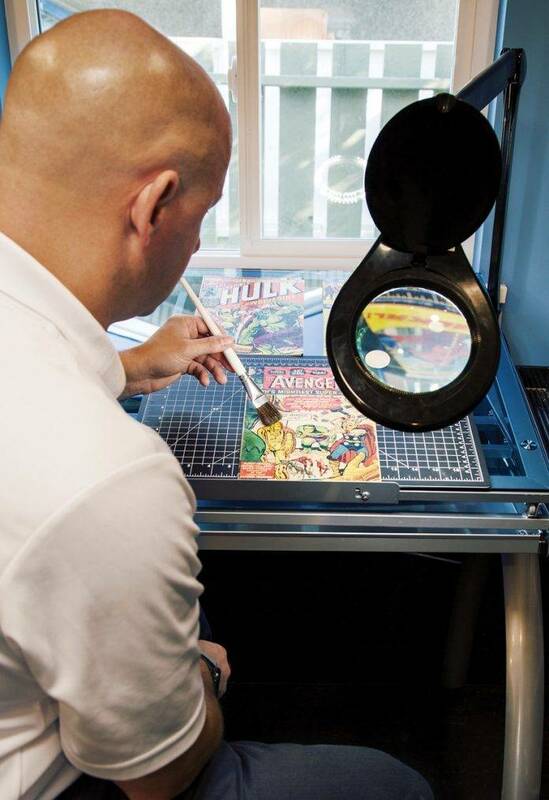 Different from restoration, where torn pages are repaired or replaced, pressing and cleaning comics involves improving wrinkle defects and dirt reduction with a dry-mount heat press, which uses a blend of temperature, pressure and duration to clean the pages. While some customs are looking to extend the longevity of a favourite comic book, others are looking for a bump in value. When a book is graded by an industry professional — a fraction of a point can more than quadruple its value, so the cleaner the better. For comics worth less than $1,500, a cleaning or pressing costs $15, but for rare and expensive comics worth more than $1,500, the price goes up. You can’t put a price on memories, but with a little help you can preserve them.